These days, new VPN providers are popping up left, right, and center making finding the Best VPN for iOS difficult. And in the oversaturated VPN market – in this case, the App Store – the sheer number of option may be overwhelming. This short review sets out to dispel that anxiety and help you pick a VPN solution that will best fit your needs. Although there are literally hundreds of different options to choose from, we narrowed down your search to just five. Regardless of whether or not you’re a VPN power user, or new to VPN altogether, this list will likely have an app for you. Before we begin, keep in mind that although all of these apps are free on the app store, the actual service is not. You can learn more on each provider’s website. IPVanish is easily one of the best VPN solutions for Mac, so it only makes sense that its mobile counterpart is equally capable. In my testing of these providers, IPVanish seemed to consistently offer the most impressive speeds. Besides being incredibly fast, IPVanish is also the most feature-packed solution listed here. Despite having a great number of configurable settings, IPVanish comes pre-configured and ready to use – ensuring that even beginners can quickly get on the internet and browse safely. If, however, you’re not new to VPN and would like to play around with some settings, there are quite a few things you can adjust. Under the settings tab, you will find a number of connectivity preferences. 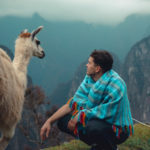 Besides having the ability to switch between the most popular VPN protocols, you have the option of further configuring your connection. 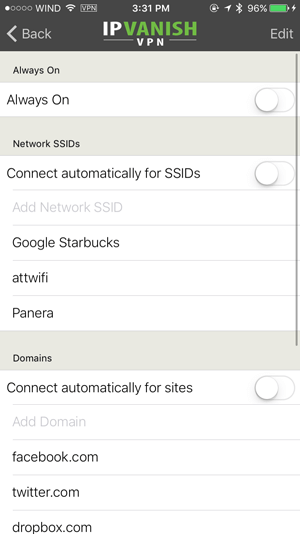 For example, you can set up IPVanish to automatically enable VPN if you connect to a public SSID, or visit a specific website. IPVanish also offers competitive pricing, and if you decide to try it for a month it’ll cost you $10, and if you think that you’re ready to commit for a full year you’re looking at about $6.50 monthly. 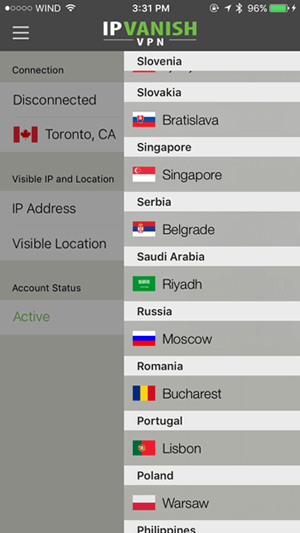 To contrast IPVanish – StrongVPN is not very configurable at all. In fact, the only user-configurable option is the server location. That being said, I found the app to work quite well. There are many server locations to choose from, and StrongVPN was one of the fastest VPN solutions I have ever used on my iPhone. The app itself is incredibly easy to use, a lot of that can probably be attributed to the fact that it’s pretty much a one click solution, but I digress. After selecting a specific server you’ll be prompted to install a VPN profile for that location before you can continue. Personally, I found this slightly frustrating, but probably only because other providers manage to work around this. After connecting to a server you’ll notice that the background of the app has changed to a reflect the location of the server. While completely unnecessary, it was an interesting and unique addition. If you’ve ever used VyprVPN on a desktop, then you’re already familiar with the user interface. 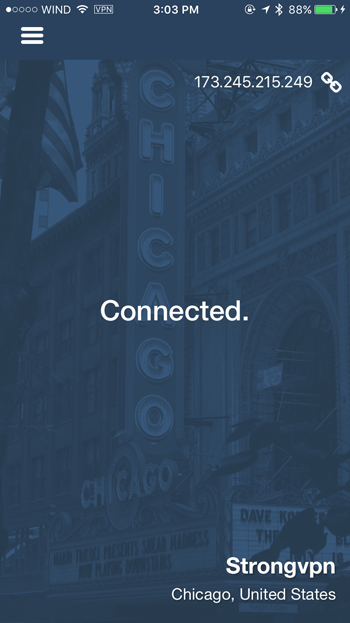 After the initial setup, you’re greeted with a huge “connect” button, which will automatically connect you to the fastest available server. This feature is perfect for beginners, or people just looking to get online as quickly as possible. If you’re looking to dig a little deeper, then you can start by manually selecting a server location. There are dozens of available options, so you’re likely to find what you’re looking for. My favourite feature of VyprVPN is the ability to judge the connection of a specific server at a glance. As you can from the screenshot below, each server has its ping value listed next to it, making it incredibly easy to pick the fastest one. 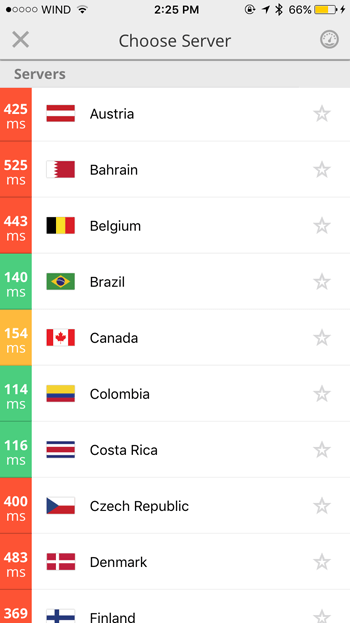 Another benefit of VyprVPN is its incredible connection speeds, which are matched only by IPVanish – in my personal experience, anyway. As far as further configuration goes, there is not much you can do – Vypr clearly thinks that they’re better suited to handle that for you. That being said, it’s not necessarily a fault of the service, just something to consider. 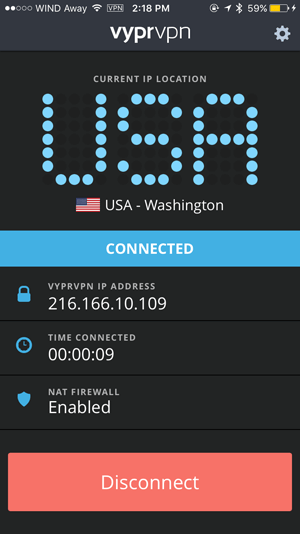 If you’re looking for a highly customizable iOS solution, then VyprVPN is not for you. When it comes to the iOS app, HideMyAss for iPhone is a much more attractive solution than its desktop counterpart. After launching the app and installing the VPN profile you’ll immediately notice how polished the design is. After flipping the VPN switch, the mascot gives you a huge thumbs up and waves the selected country’s flag. 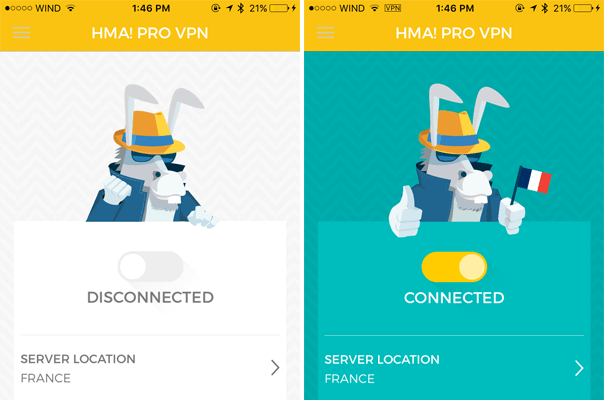 Besides being one of the best designed VPN apps out there, HMA! for iPhone offers a very similar user experience to its competitors. You can scroll through a long alphabetical list of available countries, and easy switch between servers. As a timesaver, HMA! also lets you add your most used servers to the favourites list by swiping. As far as further customization goes, there isn’t too much you can adjust manually. The settings tab of HMA! 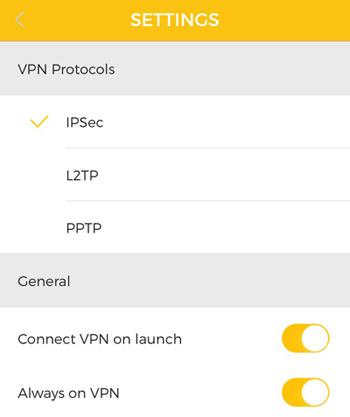 contains just three other options – the ability to easily shuffle between VPN protocols, enabling “always on” VPN and connecting to a VPN server as soon as the app is launched. Similarly to the other VPN clients listed here, you can exit the app when you’ve set it up to your liking. Just make sure to keep the app running in the background, so you don’t run into any problems. Personally, I find ExpressVPN an incredibly “bland” solution. What I mean by that is that it doesn’t do much to stand out from the competition. 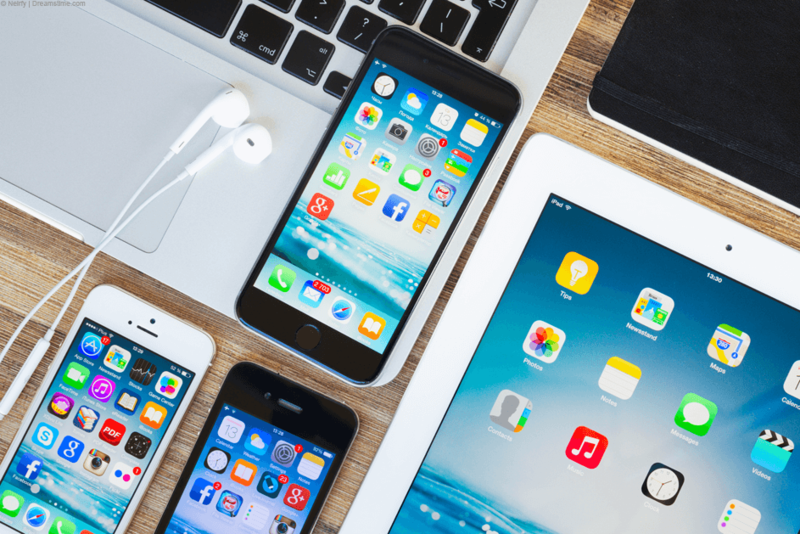 While it gets the job done, ExpressVPN has come up short in a number of ways when compared to other competitors listed here and I certainly wouldn’t say they are the best VPN for iOS. In my personal experience, ExpressVPN consistently logged the slowest speeds, even when being tested on the fastest server. Additionally, power users will be disappointed to find minimal configuration options. In fact, outside of selecting a server (number of which is limited) users can only switch between VPN protocols, and everything else is off limits. Not to mention that ExpressVPN is also the most expensive provider listed here. A month-to-month subscription will run you about $13, or approximately $8.30 if you decide to get on board for a whole year. There is a silver lining, however, ExpressVPN offers a 30-day money back guarantee, so if you’re unhappy with the service you can get a hassle-free refund. And just because I had a negative experience with ExpressVPN, it doesn’t mean that you will. After testing and using over a dozen iPhone VPN apps, these are easily some of the best available solutions. Personally, I will continue to use IPVanish as I find them the best VPN for iOS, but all other alternatives also do a great job of encrypting your data and securing your connection. Hopefully, this quick review got you thinking about your online privacy, and helped you in your search for an effective VPN solution for iOS. Like I said earlier, all of these providers offer a great service, so it all comes down to preference and the options that are important to you. Don’t over think the decision too much, just pick a provider and give them a shot. Here’s a recap of the available options.